• North Orissa: Cyclone prone. With mangroves gone, cyclones have intensified. Recently gripped by drought. Flash floods due to rapid deforestation and rise in malaria. A SECTION of scientists and clima-tologists believe that Orissa's extreme weather conditions and their frequent occurrences are a dress rehearsal for the meteorological may-hem that climate change induced by global warming would cause on earth. Scientific and empirical evidences are being put together by the scientific com-munity to prove that the state might well be showing up the impact of cli-mate change. The people of Orissa who are getting used to the calamities also feel that climate has changed for the worse and its impact is being felt every-where (see box: Silent spring). An analysis of the state's rainfall data and temperature variation reveals that summers are getting prolonged. "The state is definitely heating up," says Murari Lal, chief scientist of department of atmospheric sciences, Indian Insti-tute of Technology (IIT), Delhi. Lal has concluded that Orissa's weather condi-tions are warnings of global warming. "Abnormal weather conditions are already a reality but nobody admits it," he says. Interestingly, for the first time the Indian Meteorological Department (IMD) officials have acknowledged that there must be something seriously wrong with Orissa's climate. "Perhaps, the extreme weather condition is be-cause of climatic change or due to a general change in the behaviour of cli-mate," says S R Kalsi, deputy director general, IMD (cyclone warning). This is a virtual U-turn for the IMD, which during the heat wave of 1998 , brushed aside the international surmise that the heat wave was an indication of climate change. The unprecedented heat wave in 1998 had been linked to the El Nio effect. Immediately after the heat wave in 1998, the World Meteorological Organisation (WMO) suggested that the extreme wea-ther conditions could be linked to the El Nio phenomena which was active dur-ing that time. It is quite a paradox that the Orissa government's department dealing with disasters outrightly downplays the sug-gestion that Orissa is bearing the brunt of globe's rising temperature when its official documents admit the change in the state's ecology and weather condi-tions. The extreme ecological changes were also mentioned in a white paper on the drought of 1992-93. The paper said: "For the last few years sudden changes in the ecology are contributing to multi- ple occurrences of these tragedies every year, creating more and more problems for our people in matter of relief and rehabilitation." The white paper on the drought of 1998-99 observes: "It has been our expe-rience in a number of years that late onset and/or early withdrawal of mon-soon, erratic and inadequate rainfall and absence of soil moisture are the main reasons of drought." Scientific studies and the state's fluctua-ting weather conditions substantiate that the state is reeling under a climatic chaos. 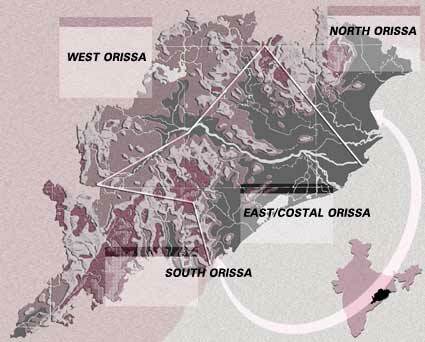 But the pertinent question is: why has Orissa been affected the most? Explains Lal, "Orissa is placed at the head of the Bay of Bengal where weather is formed. So even a slight change in sea's behaviour can have an immediate impact on the coast." The Bay becomes the centre of low pressures causing heavy rains and cyclones in the sub-continent and specially in Orissa. These cyclones and depression involve circu-lation over thousands of kilometres and form links between Orissa's atmos-phere and the entire planetary circulation system. Going by the key parameters of cli-mate like temperature and rainfall, the climate may worsen in Orissa. "The full impact of climate change does not show up immediately. It triggers changes slowly but certainly," says Lal. Scientist and national professor A P Mitra of National Physical Laboratory says, "It might be difficult to prove Orissa's direct link with global climate change but Orissa stands out as a phenomena that needs to be studied." A close look at the district-wise rain-fall of Orissa since the beginning of the 20th century indicates that before the 1950s, rainfall was less erratic. Most years, prior to 1950s, received normal or above normal rainfall. Rainfall became much more erratic since the 1960s and most of the years recorded rainfall below normal. "This is true of all the districts," says the State of Orissa's environment report that has analysed the rainfall data. Before 1957, between 67 and 90 per cent of the years recorded normal or above normal rainfall for various districts while after 1957, only 32 to 68 per cent of the years recorded normal or above normal rainfall for various districts. Similarly, the rainfall showed a ris-ing trend since the beginning of the cen-tury to the end of 1950s and then declined from 1960s onwards. The per-centage of years with normal or above normal rainfall has gone down from 90 in 1957 to 45 in 1996 in Koraput, 88 in 1957 to 45 in 1996 in Sundergarh. Similar rainfall deficiency is being experienced in Pulbani, Mayurbhanj and Dhenkanal (see table: Deficient downpour). The mean daily maximum tempe-rature of the state is also gradually increasing as also the mean daily mini-mum temperature. Says the State of Orissa's environment report: "The Titila-garh and Koraput belt comprising entire south and western Orissa has witnessed an exceptional rise in daily maximum and minimum temperature. Even the coastal areas have recorded high temperature." K L Pujari, a soil scientist who has studied the heat wave conditions in coastal Orissa agrees, "Climate change is definitely a reality. Earlier the western Orissa was a known calamity hotspot.But now the coastal areas are also experiencing heat waves. Bhubaneswar now has a temperature above 40C which is equal to interior Sambalpur." A report prepared by Lal, explaining the impact of climate change on India, underlines, "Records suggest that there has been a rising trend in all-India mean surface air temperature. The numbers of monsoon depressions and tropical cyclones forming over the Bay of Bengal and Arabian Sea reflect decline trends since 1970." Rain is caused by a depres-sion formed in the Bay of Bengal. So even a small change in a parameter like temperature will have a huge impact on Orissa. Research shows that a change of 0.5C will change the character of the monsoon. One of the striking abnor-malities will be less depression in Bay of Bengal thus causing less rainfall in the state. This is based on scientific analysis of sea behaviour during 1890-1990, according to Lal. Lal suggests that an increase in sea surface temperature will be accompa- nied by a corresponding increase in cyclone intensity. A possible increase in cyclone intensity of 10-20 per cent against a rise in sea surface temperature of 2-4C is very likely to happen. "Data strongly suggests that an increase in the intensity of cyclones is certain," he says. In a data analysis of cyclone hitting Orissa in the past century, Lal has found that intensity and frequency of cyclones have gone up in coastal Orissa.